My original interest in Rational Emotive Behaviour Therapy (REBT) came from an enthusiasm to learn and apply different psychological approaches in my sport psychology practice. In that “early development” stage of my career, like a sponge I soaked up many approaches and ideas, trying to arrive at an informed philosophy of practice that would align my own personal beliefs with my approach to working with performers. My enthusiasm has now turned into a real passion for REBT formed through gaining a deeper understanding of the approach, and through seeing the effects of REBT on those in receipt of it (via myself and others). When I first started using REBT, I was excited about its cognitive-behavioral grounding and happy that I was able to teach performers about the links between their beliefs and their emotions, promoting the infamous “it is not the event (A), it is your view of the event (B), that causes emotions (C)” concept. I was enthused by the effects I saw in performance, and by providing performers with a tool that could be used to aid their personal development. However, now, I am much more excited about the potential implications REBT has on the well-being and mental health of performers. As common as this idea might be, I get challenged on it by some practitioners. I think in many ways the Human>Performer philosophy is a bit scary for some practitioners, athletes, and coaches. The notion that we should focus on developing well-functioning people, rather than performance machines, may be a little too much to swallow for some. It is very clear to me. A well-functioning human = a well functioning athlete. A well functioning athlete is more likely to fulfill their potential. In REBT we focus on helping individuals to develop a flexible and logical philosophy of life that extends beyond performance. Many athletes I have worked with focus exclusively on the “athlete” part of themselves, often to the detriment of their personal relationships, work-life balance, and consequent well-being. REBT allows me to address the human behind the athlete. Some may argue that an athlete able to focus solely on being an athlete is able to more fully focus on performance, and is therefore more likely to fulfill their potential as an athlete. But at what cost? Recent reports suggest that mental illness in athletes, and retired athletes, is a significant issue. I often work with athletes who hold the belief that because “the athlete” is who they are, performance failure as an athlete is globalized to the whole self, such that they label themselves “a failure” – a concept that is both irrational and unhealthy (just as it would to label oneself “a success”). In the REBT literature these self-depreciation beliefs are associated with depression and unhealthy anxiety. Indeed, during the development of the Irrational Performance Beliefs Inventory (IPBI; Turner et al., in press), which is an irrational beliefs questionnaire developed for use in performance settings such as sport, we found that depreciation beliefs were significantly associated with symptoms of anxiety and depression. We have also found that irrational beliefs predict increases in physical and emotional exhaustion, a key component of burnout (Turner & Moore, in press). How about the athlete fulfilling his or her potential as a human being? Some may argue that we would be unlikely to see World Records if athletes did not adopt “must win” and “failure is fatal” attitudes. They might be right (although there is no evidence for this). But when that cost is ill-being and potential mental ill-health, is it worth it? Some may say yes. I personally don’t think it is. My Human>Performer philosophy is working for me, and helps many of the athletes/performers I work with. But it is not the only way – and the boundaries in which we work sometimes prohibit such an approach. Sometimes, we simply do not have the time or scope to fully see this philosophy through. Luckily, there are many effective strategies and techniques we can use with athletes to help them to fulfill their potential, and REBT is one option. It would be irrational to be dogmatic about the use of REBT. I think my reason for writing this Blog was not to provide justifications for my philosophy. 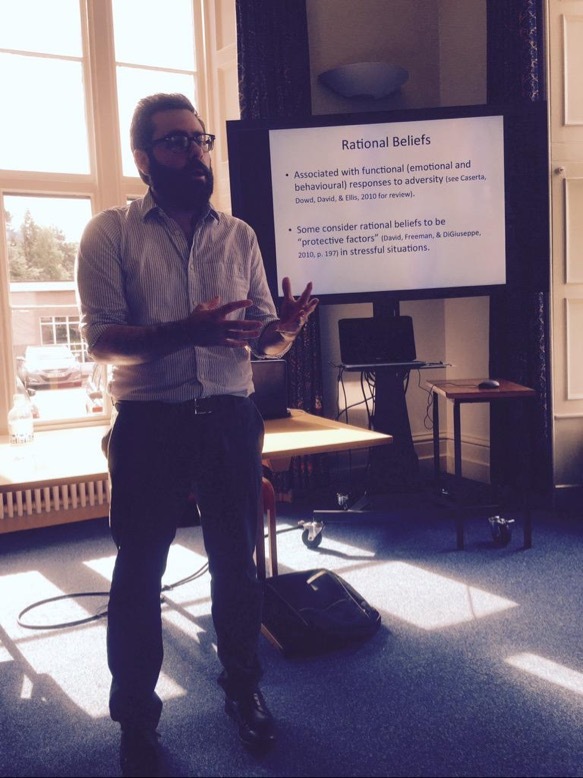 Justification can be found in the hundreds of research papers showing how effective REBT is in promoting well-being and mental health. I wanted to ask lots of questions, and hopefully stimulate debate – for and against. My engagement with REBT has helped me to strengthen my philosophy of practice, but no doubt this will shift and change as my career develops.